Home / Blog / See Spot run! I’m a dog person. I was going to say that I’m also a robot person, but that would sound like I’m saying I’m a robot. So not true! But I have been interested in robotics for a long time, dating back to graduate school. (Here’s a link to a 2015 post on the subject.) Because of these dual interests, I was of course interested in the news that Boston Dynamics’ robotic dog will become commercially available next year. 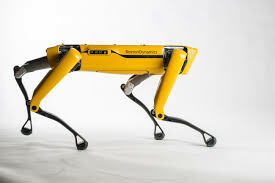 On its website, Boston Dynamics highlights that SpotMini is the “quietest robot [they] have built.” The device weighs around 66 pounds and can operate for about 90 minutes on a charge. Spot is electrically powered and hydraulically actuated. It senses its rough-terrain environment using LIDAR and stereo vision in conjunction with a suite of on-board sensors to maintain balance and negotiate rough terrain. It carries a 23 kg payload and operates for 45 minutes on a battery charge.